Hey everybody! It's spring break and you know what that means. . . road trip! 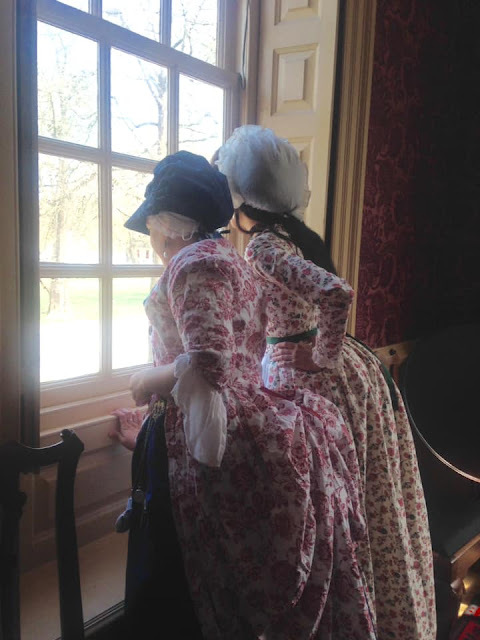 To celebrate the peak of spring, Stephanie and I took a well awaited trip down to Colonial Williamsburg. When we arrived, we were met with what can only be described as a wall of pollen...I kid you not! Pollen was everywhere you looked. But that didn't stop us. Nope! We checked into our hotel, got dressed in our 18th century gowns, and went into the historic area to meet up with my friends Kelly and Emily for a picnic on the Palace Green. Afterwards, we took a walk around Duke of Gloucester Street and visited the new and improved shops (Tarpley's and Greenhow), as well as check out the exhibits and programs. One Exhibit in particular was called "Revealing the Priceless: 40 years of African American Interpretation". For the past couple of weeks I have been preparing a new historical character for an upcoming event with Historic Annapolis in preparation for Maryland Day Weekend. 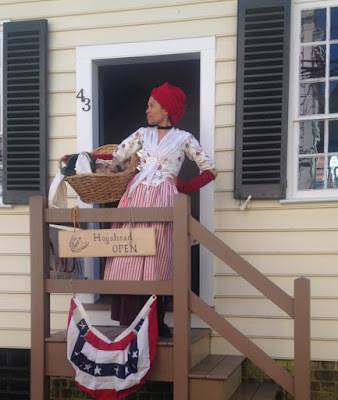 This past Sunday I portrayed Catherine Futier, a local laundress in Annapolis during the 1760's. Hey everybody. Now that Spring has finally arrived, it's a perfect time to celebrate with the first tea of the spring season. 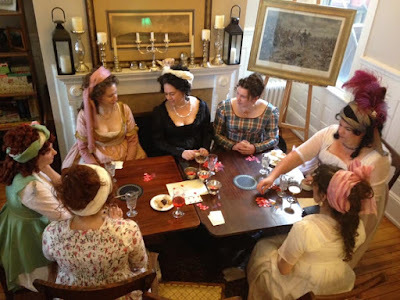 This past Sunday, I attended my good friend Carolyn's 1790's themed tea party. I have never been to one hosted by The Modern Mantua Maker before, but I'm so glad I made it because it was so much fun. I particularly enjoyed how everything was set up: Food and libations in the dining room, card games in the smaller dining room, and a space for lounging /conversing in the living room; music by Bach, Vivaldi and Handel were playing in the background to give the ambiance of the time period... It was perfect. Plus, everyone present was gorgeously dressed out in the decade between 1790-1800. Recently, I came across this article that was floating around on Facebook called "An Indian Chintz Gown: Slavery and Fashion". 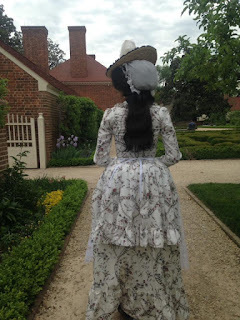 It was an amazing story about a beautiful Chintz print gown that was stolen from a woman, and then turned around and was sold to 2 different slaves, one of which was George Washington's slave named Charlotte Judge (aka Ona Judge's sister-in law). The original owner of the dress confronted the new owner Charlotte about the gown when she saw her wearing it in downtown Alexandria, and tried to get it back. Charlotte having paid for the gown fair and square, had augmented the gown the way she wanted it to look; she was a seamstress after all, and was not having any of this woman's lip. Some words were exchanged more than likely, and Charlotte was back on her way to do whatever she needed to do on her day off in Alexandria. Hello! Let me tell you a little about myself. I started participating in Rev. War reenactments when I was 11, as a seamstress, and I guess my interests continued to blossom from there. I suddenly became fascinated with the rococo and georgian fashion's of the 1700's as well as the regency period. Eventually it branched off into other areas of historical fashion that blew my mind and piqued my interest. In addition to that, I am also into cosplay,photography, and knitting. Although I may be new to the blogging world, I would love to show you what I've learned along my journey researching historical fashion.